How is your direct selling team doing? 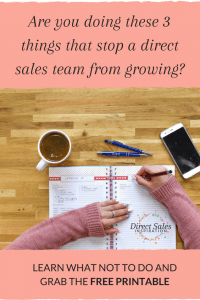 Is your team growing? 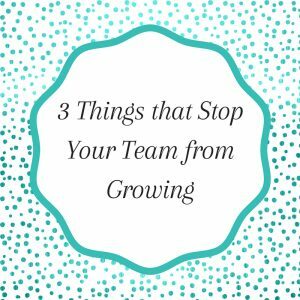 If you are working hard but your team is not growing and you feel like you’re not getting ahead, you might be doing one of these 3 things that’s holding you back. Your team’s focus depends on your focus! If your goal is to increase the size of your team but you only mention sponsoring once at the start of the month, you’re not likely to inspire any growth. To keep the team focused on sponsoring you can offer weekly training on sponsoring. Make sure you use a variety of training options such as Facebook Live, Zoom, webinars, or face-to-face sessions to cater to all your team members. Another idea is to post regular tips in your team Facebook group to remind your team of the techniques that work and to keep them focused on sponsoring. Also create exciting recognition for team members that do recruit. You could feature them in a “My Story” section in a newsletter or on Facebook, you can create beautiful awards, you can send postcards in the mail for a personal touch, you can hold a Facebook Live and shine a spotlight on all your high achievers. What you recognize gets repeated so you want to make a big deal out of recruiting. Discipline is a required trait for success! This is not negotiable. If you’re inconsistent, your team will likely be inconsistent too. For example, if you say you’re going to do a weekly recognition but you only manage to do it once or twice a month, you won’t inspire your team. Another example is cancelling meetings. It’s understandable that you might want to cancel meetings or training sessions due to low numbers. But don’t do it! If your team expects meetings or training sessions to be cancelled, why would they set aside the time to attend? When I was establishing a team in a new area I drove nearly 4 hours each way to run meetings and training sessions. I did this for 2 years. I regularly turned up to fewer than 5 people. But I ran my meetings and training sessions anyway and did the best I could for my small audience. Over time the numbers increased and I built a strong team and a fabulous leader. Whether you’re running face-to-face or online meetings, you might have to live with low attendance for a while. But if you persist and you are consistent, it will pay off. Don’t just build a team, build a community! Is there a sense of community in your direct sales team? Grab the printable below to assess how your team is doing in terms of community. If your team members feel connected and made welcome in your team, they’re more likely to stay and more likely to participate in challenges, training, meetings, etc. The more they participate and the happier they are with their direct sales tribe, the better they’ll perform. If you are focused and consistent and build your team into a warm community, you will attract more team members! Grab the Community Checklist and get my weekly email with tips - never miss a blog post again!